In 1975, an album of Bulgarian choral music was released under the title Le Mystère des Voix Bulgares, featuring performances by the by the Bulgarian State Radio & Television Female Vocal Choir. Upon release, it became a cult release, due to its haunting and powerful melodies. I first heard it in college and was completely blown away. The arrangements are simultaneously familiar and foreign, and rarely could I listen to the album without feeling chills. Though I had been in choirs for years, and felt familiar with choral music from all over the world, I had never heard anything quite like it. Le Mystère des Voix Bulgares is one of my favorite albums, and I’ve listened to it countless times over the last few years. A follow up album was released in 1987, simply called Volume II. This album would go on to win a Grammy Award in 1990 for Best Traditional Folk Recording. 18 years later, The Bulgarian Women’s Choir has returned, with the incredible BooCheeMish. One of the biggest surprises from this album is that Lisa Gerrard, the incredible artist known for her work in Dead Can Dance and countless solo project, lent her voice and star power to the women’s chorus. One of the singles from this album that features Lisa’s voice is the moving and powerful “Poro Sotunda”, which features the transcendental harmonies of the women’s choir painting a pastoral, evocative backdrop to Lisa Gerrard’s powerful contralto voice. The clever interplay between the chorus and the soloist, both rhythmically and melodically, makes for a beautiful and fascinating track. One of the biggest differences with this album is the introduction of modern instrumentation. Track 3, “Rano Ranila” features a modern beat and sound, and even has an accompanying video that features dancers in a coliseum. There are several moments throughout the album with more pronounced instrumentation, and while that could distract or take away from the album’s focus, they compliment the sound and melodies well and are generally unobtrusive. 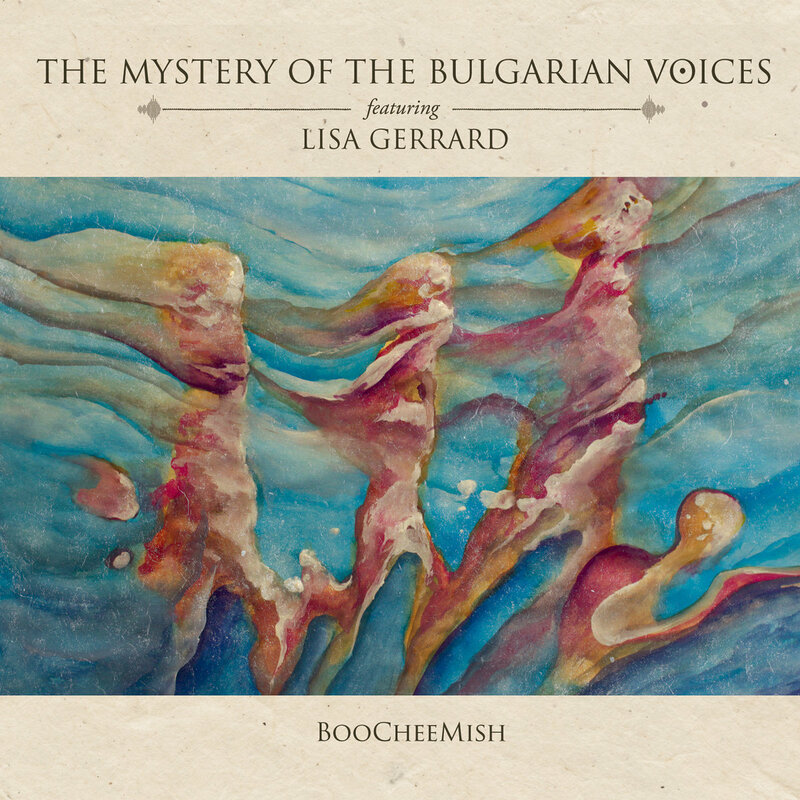 While the collaboration with Lisa Gerrard makes for some very beautiful moments, the highlight of The Mystery of Bulgarian Voices has always been the powerful, dissonant blend of the voices in the choir. In “Yove”, you can hear how the complex harmonies and rhythms blend to create something powerful and evocative. BooCheeMish is exactly what I would have hoped to hear from this ensemble in 2018. This ensemble’s unique blend and tremendous skill, when combined with various new elements such as Lisa Gerrard’s dark contralto or acoustic guitars or conga drums, takes those familiar sounds that first enamored us and builds something entirely new and lovely. BooCheeMish is powerful, haunting, and a worthy addition to an already acclaimed body of recorded work. Purchase the latest album from The Mystery of Bulgarian Voices, BooCheeMish, here on their website, on the platform of your choice. As this is an album review, I wouldn’t normally share this video, but I think this concert for KEXP showcases their incredible range and ability to handle intense dissonance. Make some time to listen to this- you won’t be sorry. Tags: boocheemish, bulgarian women's chour, lisa gerrard. Bookmark the permalink. Back in 1971 I went to the USSR on a school trip. Some of us went to a concert by a women’s choir in Kiev (now in Ukraine). The singing was exquisite. It literally brought tears to the eyes of this 19 year old lad, tears that I had to hide through embarrassment. Big boys don’t cry! This Bulgarian choir hasn’t grabbed me in quite that way but I did like the video with the old man and the bird. I liked Sluntse, the instrumental on the BooCheeMish album, too. But this isn’t prog, you know!! Thanks for sharing. Choral music can be so powerful and moving. Some of the most powerful moments I’ve ever experienced have been in that setting. And re:prog- Yes, you’re right. 🙂 It’s definitely not prog in the traditional sense. I did feel like it had enough unusual elements (odd times, dissonant harmonies, polyrhythms) that it might be an effective crossover for prog fans, but every now and then I’ll do a review album for something ‘with progressive elements’. Either way, thanks for reading and commenting!